Our Christmas Splash N Dash is always fun and it was great that so many were also able to stay afterwards and enjoy our end of year sausage sizzle. A huge thank you to RD Rob Weatherald, Junior Coordinator Luke Hansen and to the many volunteers who contributed to the success of this joint senior/junior event. As the year draws to a close and many depart Darwin for all corners of the globe, President Steve Goat and your Darwin Triathlon Club committee would like to thank all our members, from the youngest to oldest who have raced this year, all our wonderful volunteers who have given of their time, our coaches who have continued to assist members to achieve their goals and our sponsors who have contributed to our events - together we have had another fantastic year of triathlon and we look forward to bringing you more of the same in 2014. Have a safe and happy festive season. Times are posted to website. 1. From 2014 all events will have online entry. No race day registrations will be accepted. 2. Online entry for Aquathlon #1 is now open here. 3. Entry closes midday Friday 17 January 2014. 1. Track Session: Coach Lee Wilson advises Friday (20 Dec) will be the final track session for the year and will resume on Friday 10 January. Monday track for my squad will resume when school goes back on the 6 February. 2. Swim Squad: Coach Daryl Stanley advises Nightcliff swim squad (Tues & Thurs 6-7am) will resume on Tuesday 7 Jan 2014. 1. We have been advised that our junior tri gear order has been dispatched. 2. Hoping for a delivery today/tomorrow and once sorted we will email regarding collection arrangements. 1. We wish Haydn Whitty a speedy recovery from injuries sustained at IM 70.3 Canberra. A motorist drove onto the closed bike course and collided with Haydn and another competitor. The female competitor was released from hospital a few hours later but Haydn was detained overnight for scans and observation. Haydn would be first to recommend wearing of bike helmets anytime you are riding a bike. 2. Bad luck for Tim Green who was a dns at IM 70.3 Canberra due to food poisoning. 3. Former DTC president Kylie Sheffield and Shef send their regards to members. 4. Welcome back Julian Weller. 5. Farewells continue, among the most recent, Michael Varga and Liz Mackie who have headed south this week. 6. Christmas and New Year is traditionally time to make race decisions. If you are entering an away race we thoroughly recommend putting your suburb as “Darwin” and your postcode. Most race announcers recognise “Darwin” but are inclined to skip over suburbs. Also helps to let people know that we have a thriving tri community in the Top End. 7. Don’t forget we go to online registration for all our events in the New Year. This will reduce workload for volunteers, enable us to know how many competitors we need to cater for and also save our members from raiding the kid’s money boxes to find change for race entry fees. 8. Our fees have also had a small increase to help cover the cost of water safety, St John Ambulance attendance at events, permits etc. Fees include online processing charge. 9. Racing away over the next month or so? Do let us know where you (or someone you know) will be lining up. 10. This is the last E News for 2013 – do hope you have enjoyed receiving it. Any news or announcements over the holiday season will be posted to our Facebook page and website, so check in regularly. We had fantastic conditions for our Splash N Dash at the Waterfront on Saturday evening. With a cruise ship for a back drop and dress up Christmas functions in full swing around us, it was the perfect location! A huge thank you to RDs Stu & Ali Fitch, our equipment officer John Arrigo and the many volunteers who helped stage this event for our members, your assistance was very much appreciated by all who competed. As if you needed any reminders … the festive season is now well and truly here. Already many of you have donned the Santa gear, reindeer antlers or been jingling away at various Christmas functions and activities. The fun and frivolity continued at the Variety Santa Run yesterday with many of our members taking part. We know everyone gets crazy busy at this time of year but we are hoping you have added our final event for 2013 to your social calendar. It’s our annual Xmas Splash N Dash (details below) which is a combined junior/senior event. Adults do their race, juniors theirs and then it’s time for the highlight of the year – the Junior/Senior Relay!! Competition stakes are high and we know some creative team matching is already taking place. Don’t forget to be Christmas themed up for this one – be as elaborate or as simple as you want. Invite is again attached. Results & updated point score posted to our website. 1. The eight member junior development team blitzed Splash N Dash again on Saturday evening. We noticed a very dapper Dave Croser was a stand in kid for one portion of the run leg. 2. Don’t forget that from January 2014 all our events will have online entry and you will find the link on our events page of the website. Event fee (including online fee) will be $10 in 2014. 3. Great to see 99% remembered their timing chip for Splash N Dash. 4. If you are one of those leaving town and know you won’t be back it would be great if you could return your timing chip. Please hand to one of the committee. 5. Junior tri gear order has been placed with delivery expected prior to Christmas. If you ordered, watch for email notification. 6. James Geddes, Steve Goat and Bryan Hopkins head for WA for a date with IM Western Australia this coming weekend. Good luck guys! You can follow live. 7. Registration for the 2014 Outgames Aquathlon is open. Further information here. Games fee $110 and sport entry fee $50 applies. ... you don't care where, when, or what format - if the club puts on the event you are in. Cyclone warnings aside, do hope you are all enjoying this patch of cooler weather. Great to see many of you out there training regardless. Hearing a lot of you were successful in dodging the rain completely. The BoM radar is a valuable training resource at this time of year! Are you ready for it? Our splash n dash action returns to the Waterfront – at the very social time of 6pm - on Saturday evening. If you are staying on for a meal at one of the many restaurants or cafes, suggest making a booking would be a good idea. There is always the wharf close by as well. Our junior tri gear order has been extended until midday today (see details below). 2. Torsos must be covered during the run. 3. Take a look around you before leaving and make sure you have all your gear. 1. We need a few more orders to ensure this goes ahead so online ordering has been extended until 2pm. 2. All details, photos, order and payment can be made here. 1. Due to some unforeseen issues with venues a number of changes have been made to our calendar. 2. This may also impact on events you may have volunteered for. 3. Please check the calendar here as an event you volunteered for may have been rescheduled or may have been deleted. 4. Volunteers are still required for a number of events. Please email your preferred event and roster position here. 5. We look forward to seeing all the positions filled very soon. 1. Ironman 70.3 World Champs for 2015 will be heading to Europe. Norway, France, Luxembourg & Austria are the finalists. Watch this space. 2. Congratulations to Glen Scholz & Kylie Gaffel on the announcement of their engagement. 3. Our senior tri gear order is now back. There are still a couple of people yet to respond to email regarding collection options. 4. 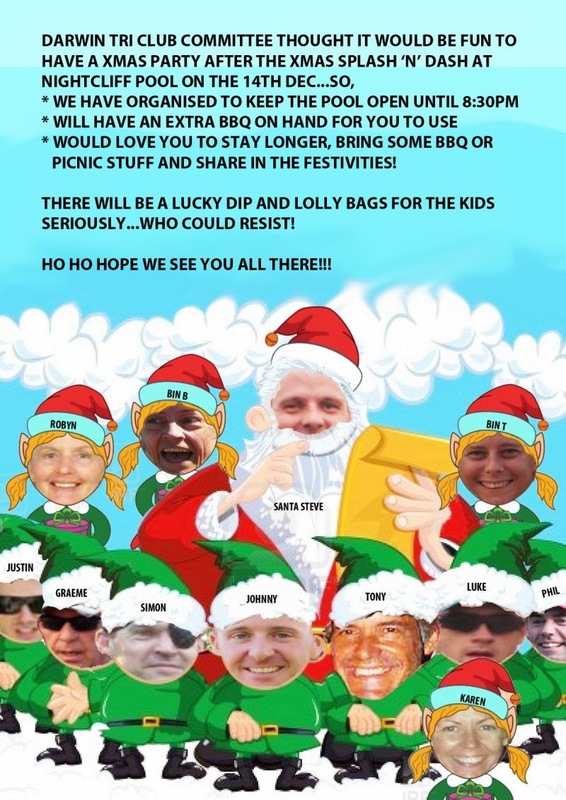 Date claimer – our combined junior/senior Christmas Splash N Dash Sat 14 Dec 13 will be followed by Xmas Party and we hope many of you will be able to stay on. 5. On a Christmas note, if you are hoping for go faster gear from Santa, now would be a great time to pay a visit to your local bike shop. No point in waiting until the week before finding they have to order in. Don’t be disappointed head on in now. 6. We have a number of members on count down for departure from Darwin. We know they will take a little of Darwin Tri Club with them, and even continue to wear their tri gear at events (.. best ice breaker around) and keep in touch. We love to hear how our former members are doing & their event results and with so many of us travelling interstate/overseas there is a fair chance that we will catch up again sometime soon. All the best to those taking off. Big weekend of tri starting with our Waterfront Splash N Dash on Friday evening and back again at the lagoon on Sunday morning for the juniors who also had an aquathlon format there. The weather was muggy, but luckily we didn’t have any storms to contend with as has previously been the norm down at the Waterfront. A huge thank you to RD Russell Peacock & all the other volunteers for their efforts on Friday. The course was well marked & marshalled and everything looked very professional much to the delight of the spectators. Same again yesterday morning, when junior coordinator Luke Hansen along with John Thyne and Belinda Rowley had the kids worn out but smiling at the end of their events. A big thank you once again to all our fantastic volunteers. 5. Items for next E News by Sunday 9pm please. 1. ITU Auckland has a raft of events to suit all ages and levels of experience. If you are looking to head over the ditch early in April it may suit. Further info here. Early bird pricing until end of November. 2. Bali International Triathlon date 22 June 2014. 3. Uniform order just received. Watch for email soon regarding collection. 4. Junior uniform order link will be out soon. So has to get items back prior to Christmas will be asking for orders to be in Friday. 5. Have a great week. Our Enduro is always exciting and as much a mental, as a physical undertaking. And yes, it happened. One of the guys was spotted running in his bike helmet – no names but he was very tall, is a firie and was third overall. A big thank you to our one armed RD Luke Hansen (due to recent shoulder surgery) and to all the helpers who made this event happen. We have fantastic volunteers and, as always, appreciate their willingness to contribute their time to assist. We also sincerely thank those who pitched in to help clear rubbish made by overnight party goers. It was disappointing to find one of our prime public areas in that condition due to the selfishness of the minority. We are now calling for volunteers for the remainder of the events on our calendar and ask that all members volunteer at least once a season. If you are yet to put your hand up, there are plenty of opportunities coming up in the New Year. Please check our events calendar and email your preferred event and roster position. 2. Items for E News by 8pm Sunday. 1. Congrats to Geri Ford for her efforts at XTERRA Maui last weekend. We are thinking Geri is the first from DTC to have competed at this event. Can anyone recall any other Darwin representatives? 2. Commiserations to Tass Liveris who has succumbed to a tibia fracture which, after months of training, put him out of the Athens Marathon. We wish him a speedy recovery. Enjoy that holiday anyway Tass! 3. You may have noticed Rob Brooks hobbling around on crutches. Rob had some surgery on his foot recently. Our wishes for a speedy recovery also go to Rob. 4. Just a reminder – if you are intending to participate in our events you must be registered, body marked, racked and ready to listen to the race brief which takes place 5-10 mins prior to start time. We have had to disappoint a couple of late comers recently. Registration closes 15 mins before start time. Remember those on registration are volunteers and may well be racing themselves. 5. We had some of the NT junior development squad participating in teams yesterday. They were very enthusiastic and knew what they were doing due to some creative colour coding. 6. Very soon the splash and dash season will be upon us with the first race coming up at the Waterfront on Friday 15 November 13. To prepare for these events coach John Thyne is planning to run training sessions at the Waterfront on Wednesday 6 and 13 of November. Start time will be 5.30pm and will go for about 45 minutes. So if you are keen to have a practice at this multiple run swim format then come along to the training. This session is open to everyone (12 year and older) who is wanting to do the races, is new to triathlon or is thinking about getting involved and would like to come along and see what it is like. Bring your goggles, swimmers, running shoes and drink bottle. No charge just come along and get involved. Contact John on 0423 797 401 if you would like more information. 7. A dag of the year nomination coming up for the athlete who was stuck in one gear yesterday as she forgot to replace the battery of her electronic gears after removing it to recharge. 9. Those heading west for Ironman 70.3 Mandurah include Jana Van Voorthuizen, Corinne Fabian, Cath Meng and Stu Fitch. We wish them good tri-ing! 10. We also have a number of athletes competing in the Australian Age Group Long Course Championships (Murray Man) in SA this weekend including Amy Pallentine, Graeme Parsons, Steve Goat, Justin Tranter, Lucy Thompson, Tim Green, Stef Puszka, Daryl Stanley, Phil Blumberg and Dionne Walsh. Go, go, go! Our juniors were in action at Lake Alexander yesterday morning and as always it was a pleasure to watch them having swim, bike, run fun. A big thank you to our junior coordinator Luke Hansen and other key volunteers including Belinda Rowley, John Thyne and Steve Goat. The kids loved it and it’s great to watch their skills develop. Speaking of skills, you will need some on Sunday when we bring you our mentally & physically stimulating Enduro format. With all those transitions to get through, it takes a little added thought to make sure you aren’t heading for the water in your sunglasses! Tip: Visualise your setup and transitions before race day. 3. STOLEN-BORROWED: Evolution Edge Multi-sport Kayak Very hard to conceal - 6.8 m in length. Fire Engine Red in colour. Was in a green and white striped canvas cover. If you see it somewhere please contact Tim 0437 602 346. 1. Congratulations Marcus Lisle, current world no 2 & Australian no 1 M35-39, in Ironman Overall Age Group Rankings. 2. Congratulations Stef Puszka, current Australian no 1 F25-29, in Ironman Overall Age Group Rankings. 3. Our uniform order has been placed. We will email when it is back, packed & ready for collection. 4. Just you just hate it when someone steals your water bottle when you are out running. 5. We have added some extra sessions to those offered by our coaches. Please check the Training page of our website. 6. We have Shellie Ratahi, Oliver Cook, Trent Jensen, Angelika Hannon and Brian Hannon among those on the start list for Noosa Triathlon this weekend. We wish them good tri luck. 7. Check our Facebook page for photos from yesterday’s junior triathlon. 8. Emma Moffat donated her bonus prize money ($2000) from Nepean Triathlon to the Bushfire Appeal.